The wait is over. 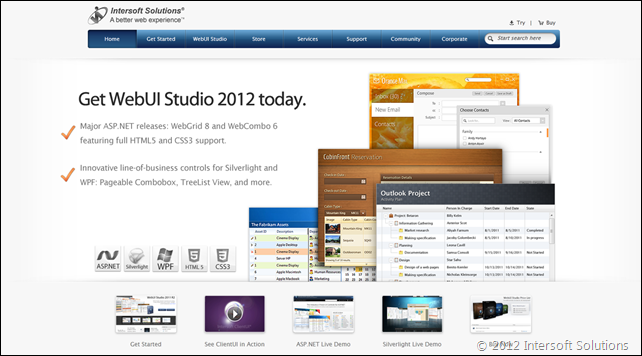 We’re incredibly excited to announce the immediate availability of WebUI Studio 2012 today! The new release ships major upgrades for the flagship ASP.NET data controls such as WebGrid and WebCombo – featuring full HTML5 support, and includes dozens of must-have data controls specifically designed to address line-of-business scenarios in Silverlight/WPF application development. You can download your copy here. And while waiting for the download, be sure to check out the complete what’s new list here. In addition, you might want to check out many updates that we’ve put together in this release including the live samples for both ASP.NET and Silverlight, as well as online documentation. The WebGrid documentation is now completely revamped to match the new documentation standards and guidelines that we introduced in ClientUI. Along with the new release, we’re pleased to announce the launch of Intersoft’s new website design. Completely revamped for the best user experiences, you can now get around faster and easier than ever before. And with clean yet elegant design, you can focus on the information and content better. We hope you liked our redesigned website! Last but not least, enjoy WebUI Studio 2012! Again, click here to download the new 2012 today if you haven’t. We hope you love the new release as much as we love building it! Note: For active subscribers, you will receive the new license keys within 24 hour. Make sure you have whitelisted the intersoftpt.com domain to avoid communication problems. Great news, but sadly no Metro theme for SL & WPF. Excellent Features especially the Region Adapters. I’m glad to hear that you find our examples useful. Regarding SelectionControlRegionAdapter, it’s pretty much similar to ItemsControl, with a difference that it can be activated through the Region API, i.e., region.Activate(). When activated, the particular view will become selected. You can use this adapter in all Intersoft selection controls such as UXListBox, UXComboBox, UXContextMenu, etc.